An enterprising Michigan florist beat Amazon to the skies with a delivery of flowers via an unmanned aerial vehicle (UAV). But then the Federal Aviation Administration (FAA) shut them down before the industry’s second-biggest season of the year — Valentine’s Day. 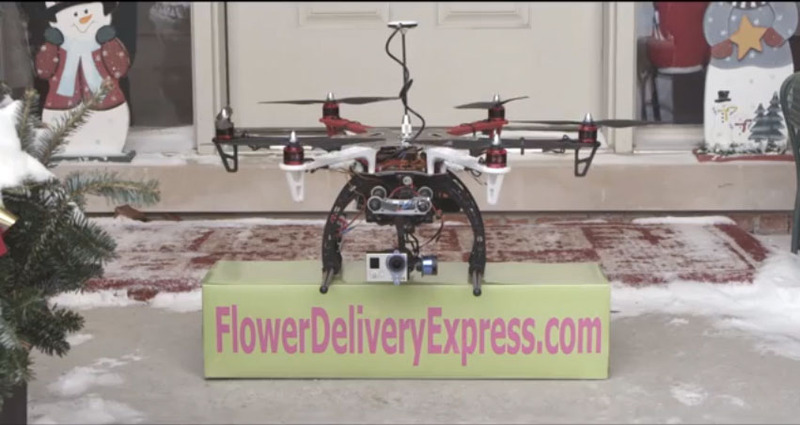 FlowerDeliveryExpress.com recently conducted the first flower delivery by drone, according to company CEO Wesley Berry. Subsequently, however, they heard from the FAA, which informed the company that commercial use is only authorized on a case-by-case basis, forcing the company to halt testing with drones. “Anyone who wants to fly an aircraft, manned or unmanned, in U.S. airspace needs some level of authorization from the FAA," according to an FAA spokesperson. FlowerDeliveryExpress.com had intended to deliver as many free rose bouquets as possible to a beta test group on Valentine’s Day so as to benchmark the delivery capacity of its drone. The Internet-driven company currently uses traditional delivery methods to serve several million customers across the country. The drone flower delivery, which took place Saturday, February 8, 2014, in the Detroit metro area, can be viewed on YouTube here. But at least the commercial effort got off the ground temporarily. Last December, Amazon CEO Jeff Bezos announced on CBS’s “60 Minutes” news show that his company is testing “octocopters,” a rotary-winged unmanned aerial vehicles (UAVs) with eight rotors that within four or five years could be delivering packages in as little as half an hour after an online purchase. But Amazon is playing by the FAA rules and not flying commercial cargo without permits. "Unfortunately, we can no longer conduct testing of delivering flowers by drone," said FlowerDeliveryExpress.com’s Berry. "However, the good news is that this technology is here to stay. When the time is right, we’ll be ready for orders to be delivered, not by an address, but by GPS coordinates. It’s exciting to plan the future of the business based on this emerging technology." The company’s is seeking U.S. residents to take part in consumer focus groups to beta test UAV delivery methods and other marketing development efforts. Interested individuals can sign up for the beta test group online. According to the company, FlowerDeliveryExpress.com is a multi-million dollar online floral delivery operation. Berry also owns Wesley Berry Flowers, a Detroit-based brick-and-mortar florist established in 1946. It was the second blow in recent months to Detroit’s aspirations to be a player in unmanned systems. In January, Detroit Aircraft Company, the Michigan Unmanned Aerial Systems Consortium (MI-UAS), and airports in Michigan lost out in the initial round of competition to host one of the FAA’s unmanned aerial system (UAS) test sites. The UAVs being designed by Amazon’s next-generation R&D lab for its Prime Air project can handle loads of up to five pounds. About 86 percent of Amazon deliveries would fall within that weight restriction. Q: Is this science fiction or is this real? A: It looks like science fiction, but it’s real. From a technology point of view, we’ll be ready to enter commercial operations as soon as the necessary regulations are in place. The Federal Aviation Administration (FAA) is actively working on rules for unmanned aerial vehicles. Q: One day we’ll see a fleet of Prime Air vehicles in the sky? A: Yes. One day, Prime Air vehicles will be as normal as seeing mail trucks on the road today. Q: When will I be able to choose Prime Air as a delivery option? A: We hope the FAA’s rules will be in place as early as sometime in 2015. We will be ready at that time. Q: How are you going to ensure public safety? A: The FAA is actively working on rules and an approach for unmanned aerial vehicles that will prioritize public safety. Safety will be our top priority, and our vehicles will be built with multiple redundancies and designed to commercial aviation standards.